A new program is serving to bridge Korean history to the contemporary food and farm justice movements. 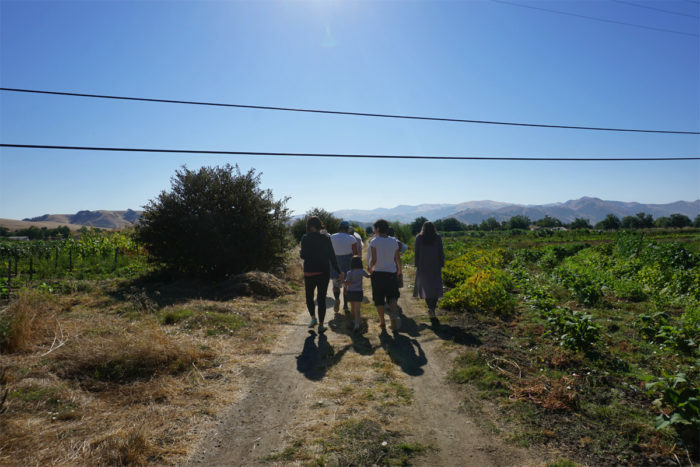 It’s been a hot summer out in Sunol, California, about an hour east of San Francisco, but every couple of weeks, a group of Korean-American volunteers has been gathering at Namu Farm to weed melons, pick perilla, and learn about sustainable farming. Most are in their 20s and 30s, but they represent a broad cross-section of the Korean diaspora, including Koreans of mixed heritage and Korean adoptees. They’re part of a new project called nonghwal, run by farmer Kristyn Leach and community organizer Yong Chan Miller. 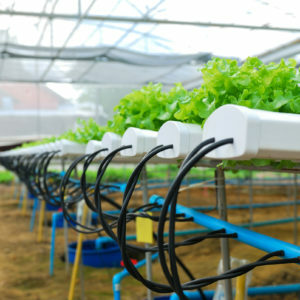 Namu Farm, which grows produce in the Sunol AgPark, for the San Francisco-based restaurant Namu-Gaji, makes sense as the site for nonghwal. Short for nongchon bongsa hwaldong, or rural volunteer activities, nonghwal has always been intertwined with social movements in Korea. 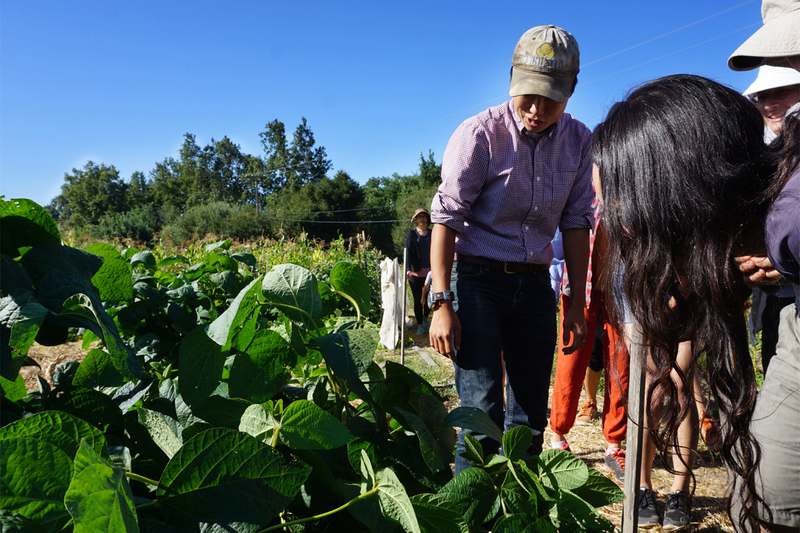 Now, with about a dozen participants each month, the program is serving to bridge Korean history to the contemporary food and farm justice movements in California. The program’s origins stretch back into the Japanese colonial period, when students went into the countryside to help raise literacy rates in the rural population. Nonghwal reached its heyday during the democracy movements of the ‘60s, ‘70s, and ‘80s, when organizers and students, mostly from elite universities in Seoul, mobilized against authoritarian regimes that violently suppressed resistance. Students stayed in farming villages on their vacations, weeding rice paddies and mucking outhouses by day and holding political discussions by night. Paul Y. Chang, Associate Professor of Sociology at Harvard and author of Protest Dialectics: State Repression and South Korea’s Democracy Movement, 1970-1979, explains that nonghwal was part of a “three-hwal movement” that also involved students going into factories (gonghwal) and mines (gwanghwal). These formative experiences helped change the nature of the movement overall. It wasn’t always perfect. Chang notes that students had “a romantic notion of rural Korea, but also a kind of patronizing attitude where they thought it was their duty to mobilize these naive, uneducated farmers who were otherwise being co-opted and appropriated by the government.” Sometimes the students and farmers clashed over differences in expectations. Over time, however, many of the nonghwal participants found themselves questioning this farmer-as-object attitude and changed their approach. Some even became farmers themselves. After South Korea ushered in democracy in 1988, social movement organizations splintered and farmer protests continued over trade liberalization and land disputes. 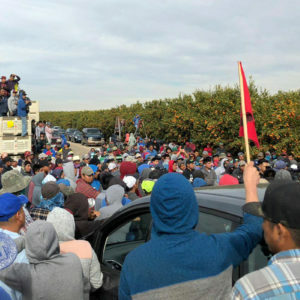 Today, farmers are a vocal part of ongoing political struggles. Just last year, farmers from all corners of the country joined the massive protests against then President Park Geun-hye in Seoul that captivated the world, many of them driving their tractors and trucks toward the capital until they were stopped by police. Nonghwal is rooted in this same spirit of resistance and continues today. Many nonghwal programs now center around environmental issues and position farmers as the teachers. At a short nonghwal in Korea that I joined last year, we called the farmers “nongbu-nim” and “seonsaeng-nim,” using honorifics traditionally reserved for scholars and doctors. 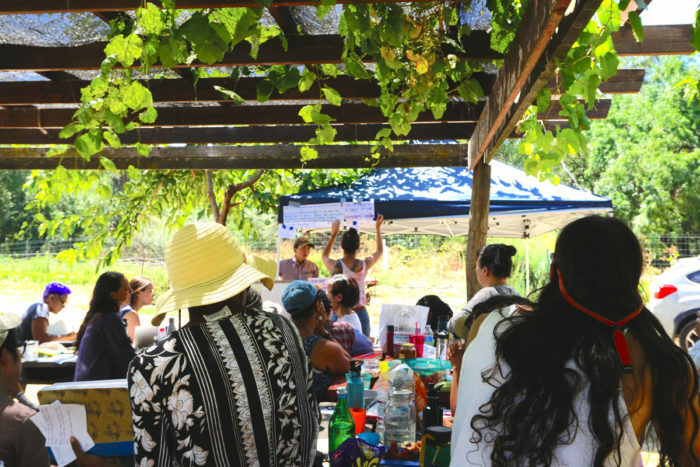 Miller and Leach’s nonghwal program in California has coalesced around one question in particular: How can we support farmers of color growing heritage varietals? Farmers of color around the U.S. have historically faced structural barriers such as access to land and capital. 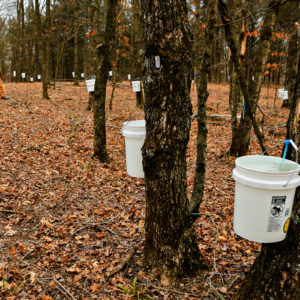 But there’s an additional level of irony for those struggling to reclaim their traditional farming methods. As Leach points out, many of the same colonial forces that exported industrial farming and replaced traditional methods in places like postwar Korea now profit from marketing organic and “natural” foods back to the same people whose ancestors once grew them. “People get dispossessed of that knowledge and then it gets repackaged and sold back,” she says. A central piece of resistance to white supremacy is seed sovereignty—the right to save and claim ownership over one’s own seeds—an issue Leach says is still a blind spot even within the organic movement, itself a largely white-dominated space. At a time when the issue of seed ownership is more fraught than ever (just four corporations will soon own over half of the world’s seeds), indigenous farmers and other people of color in the food system often get lost in the churn. Beyond the politics, nonghwal has also had a deeply personal impact on the participants. Member Natasha Harden remembers her first time on the farm: “With anything to do with identity, as a mixed person, I’m always nervous to go because I don’t want to stick out.” But it was on that first day, when Leach asked everyone to sit quietly between the rows of perilla, Harden says listening to her ancestors and the plants, and seeing another participant’s young daughter run through the field yelling “Umma!” (Korean for mother), something shifted.